If you're looking for a night time party where the booze flows free and the music is loud, then the SantaMaria may be the tour for you. This double-decker catamaran will pass the beautiful skyline of Puerto Vallarta at sunset, giving you a glimpse at one of the most scenic and romantic cities anywhere. Pass Los Arcos and Mismaloya and hear the story of Night of the Iguana. Then the party starts as the boat stops just outside the Malecon at the heart of the Puerto Vallarta nightlife scene, with dancing, music, karaoke, and wild audience participation games. The booze flows free from the open bar throughout the evening as you let loose and have fun! 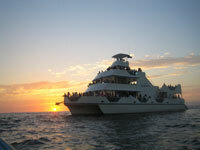 Departs From: Marine Terminal in Puerto Vallarta Directions will be included with your confirmation.